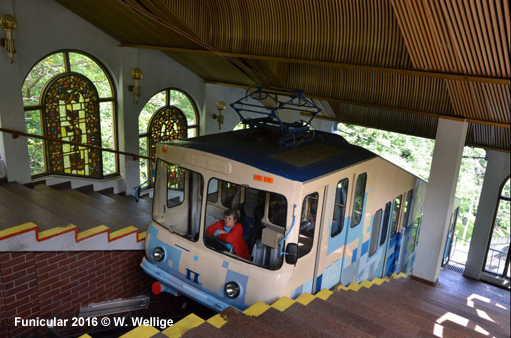 Click here for full map including tram and railway lines! 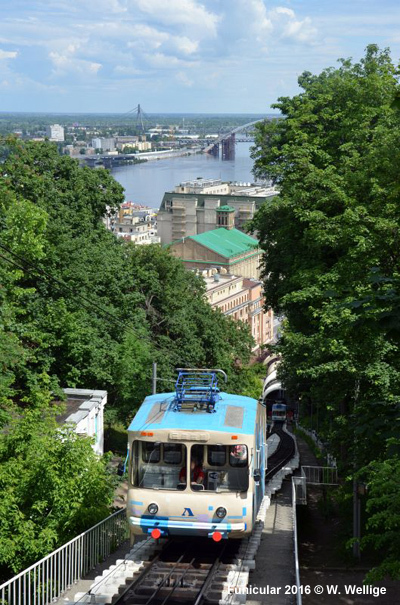 The capital of Ukraine, is situated on the river Dnipro and has about 2.6 million inhabitants. 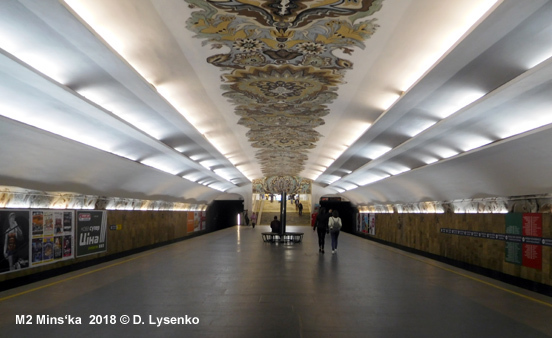 Its metro system is a typical ex-Soviet three line system (total length 67.6 km in Nov 2013) with all lines meeting in the city centre to form a triangle. 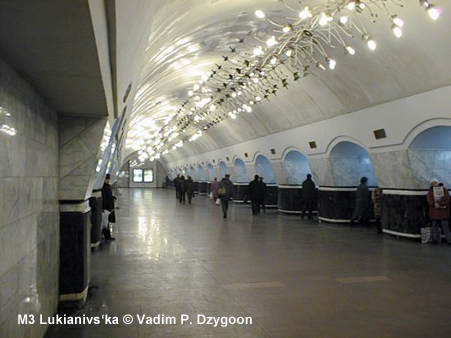 Older stations in the city centre were built in the underground palace style similar to Moscow's metro. 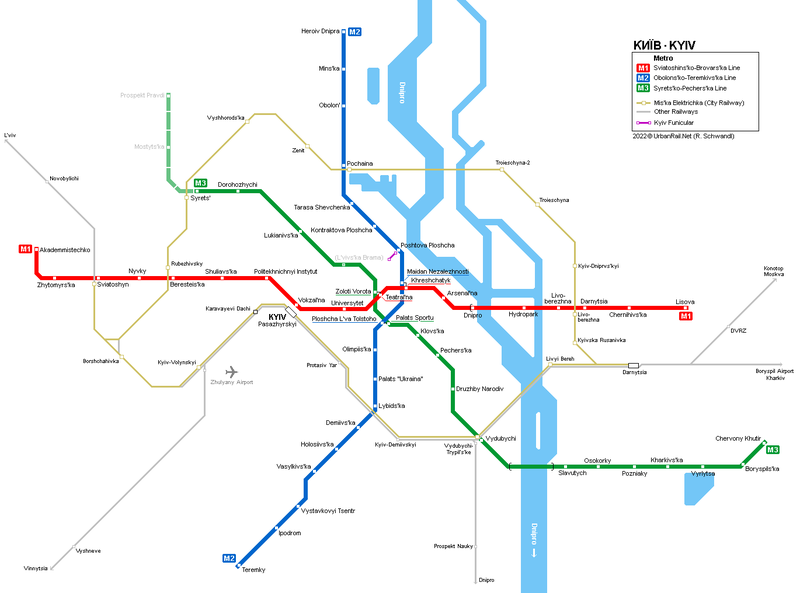 The network is entirely underground on the right bank of the river Dnipro (Dnieper) with two bridge-crossings of the river and one at-grade stretch on Line 1 on the left bank. 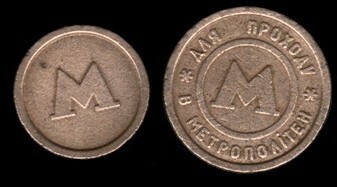 Apart from the Metro there are two rapid tram lines, with the first operating from the Railway Station (Vokzal'na) to the western suburbs (Kil'tseva Doroha, 9.1 km, 1977). Running in the median of a major road, after 20 years of operation, the line was upgraded in 2009/2010. 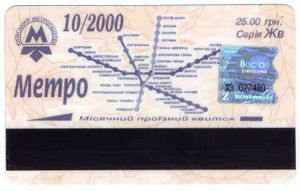 A branch to Mikhailsvs'ka Borschahivska, which has a more light rail type alignment, was added in 1984. 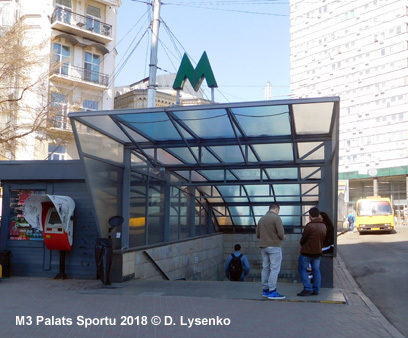 A second 6.7 km rapid tram line is in service in the district of Troeschyna in the north of the left bank now connecting Troeschina-2, a new station on the city ring railway, with the standard tram system at Miloslavs'ka. 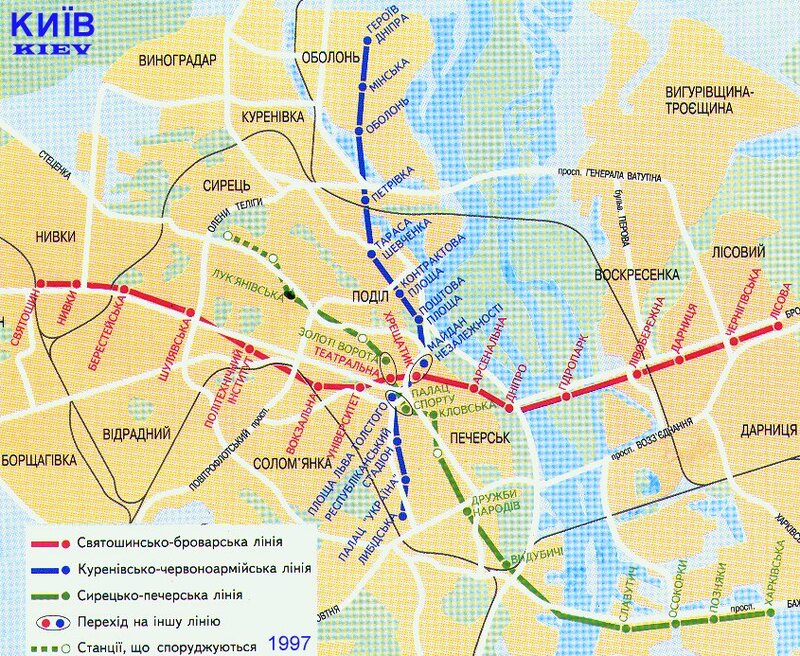 In 1960 the first part of the first line (Sviatoshyns'ko-Brovars'ka) opened between Vokzal'na (Central Station) and Dnipro. 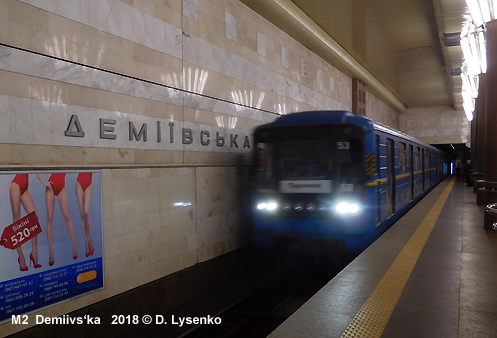 The latter station with side platforms is situated on the bridge over the motorway along the bank of the Dnieper river. After this station, eastbound, the line crosses the river on a dedicated metro bridge and continues on the surface to the eastern terminus. 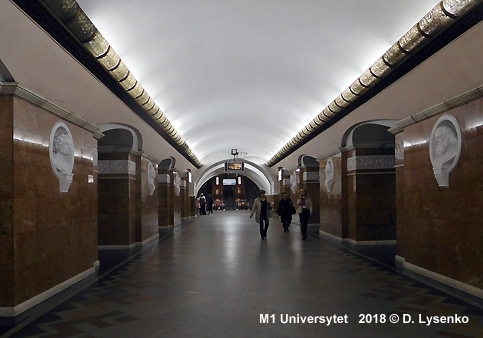 Although one more station at the western end had been planned to create a transfer to Novobilychi commuter rail station, no extensions of this line are expected in the near future. 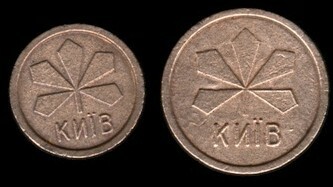 30 Dec 1996: Zoloti Vorota - Lukianivs'ka (3.1 km; L'vivs'ka Brama not finished). 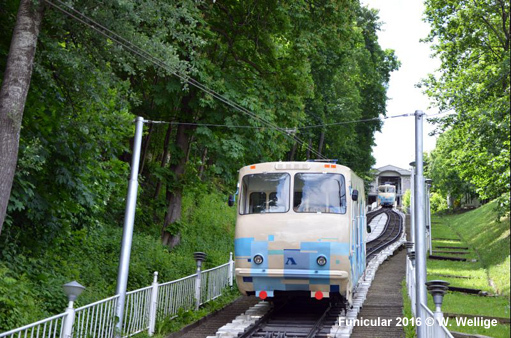 There are two built in draft stations on this line, L'vivs'ka Brama and Telychka. The opening of L'vivs'ka Brama depends on the finishing of replanning and reconstruction of L'vivs'ka Sq. above the station to know the location of station entrances to build escalator tunnels toward them. 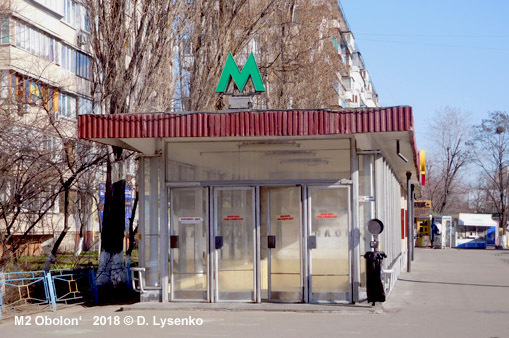 Telychka station between Vydubychi and Slavutych on the right bank of the Dnieper River will be opened later, when the industrial zone around it will be transformed into large residential and an office complex. 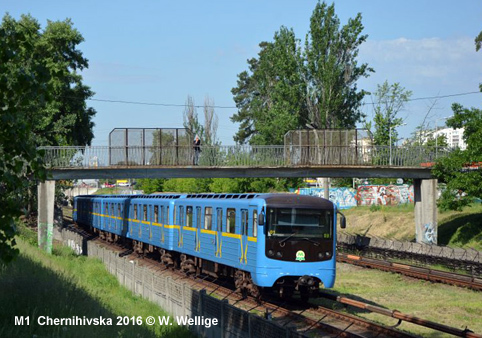 The Green Line is being extended towards the northwest to reach Mostyts'ka and Prospekt Pravdi with one more depot for this line. 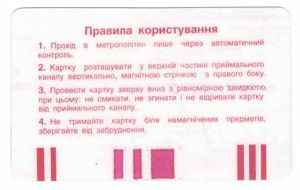 Later a fill-in station called L'vivs'ka Brama station may open between Lukianivs'ka and Zoloti Vorota. 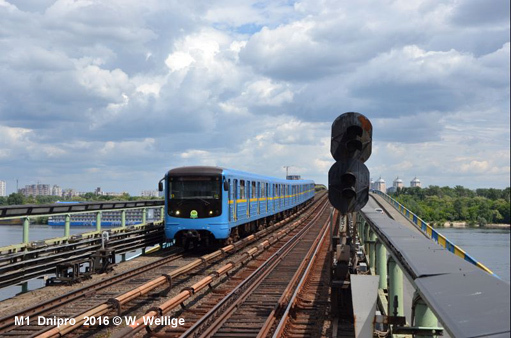 Since late 2004, a new two-level motorway/metro Podil's'kyi bridge is being built over the Dnieper River to connect Central railway station (Vokzal'na) with residential zones on the north of the left-bank part of Kyiv. 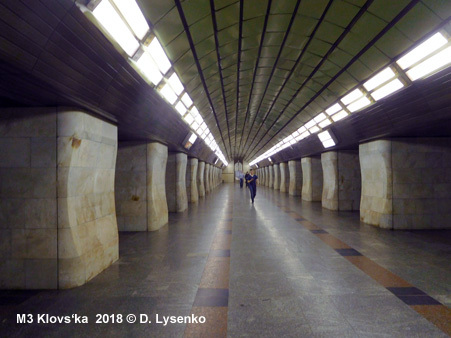 The line using this bridge, will intersect with all existing lines (Line 1 at Vokzal'naya, Line 3 at Lukyanivs'ka, Line 2 at Tarasa Shevchenka).